Every night out has a story behind it … whether it’s one you’re fond of repeating or not! In Sydney, you’ll find nightlife you’ll want to boast to all your friends about, be it for the stellar sites, the amazing ales or fabulous food. And there’s plenty of places with an interesting tale to tell too. Discover the past lives of Sydney’s night life while making memories of your own. 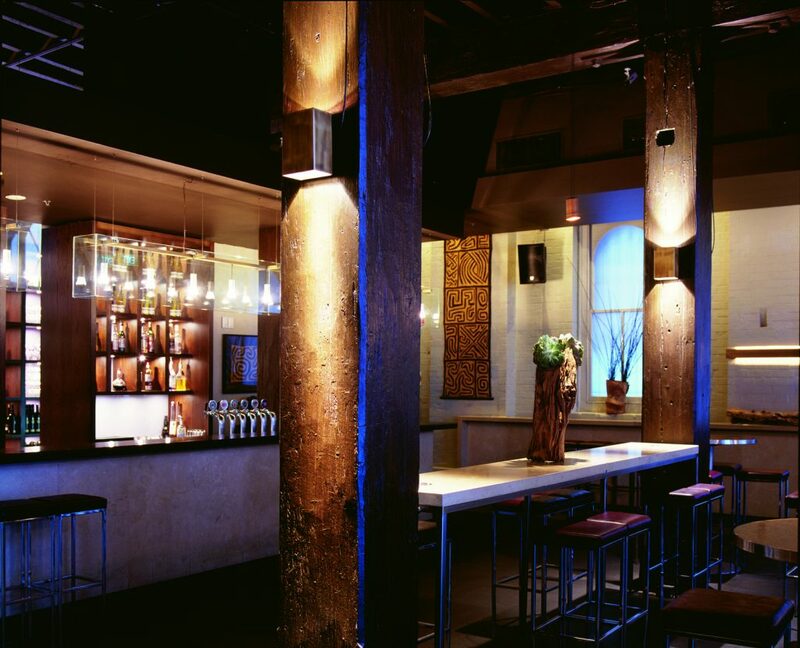 If you want a great night out for a good cause, look no further than our very own Song Hotel Sydney. Song Kitchen serves up a mouth-watering menu, created from a pure love of food. Open for breakfast, lunch and dinner (the scrumptious delights range from buttermilk pancakes to Sydney rock oysters and succulent duck breast with sautéed potatoes and mushrooms) there’s plenty of options to satisfy the appetite, as well as a thirst – the carefully curated drinks list showcases some of the the best NSW and Australian wines. We’re pretty proud of our delicious menu and impressive wall of wine, but we’re even prouder still that 100 per cent of profits from Song Kitchen go directly to YWCA NSW programs and services supporting women and children escaping domestic violence. Come dine with us and you’ll have the pleasure of the experience and the knowledge that your dollar is making a difference in the community. Breakfast daily till 11:30am; lunch Tuesday – Friday, 12pm – 3pm; dinner Tuesday – Saturday, 5pm-10pm. A tank stream, once the source of fresh water for Sydney’s early white settlers, still flows under its namesake bar that is a favoured watering hole for modern city dwellers. The intimate lighting, wooden ceiling and wine rack walls inside the tucked-away Tank Stream Bar are designed to channel Sydney’s convict past. 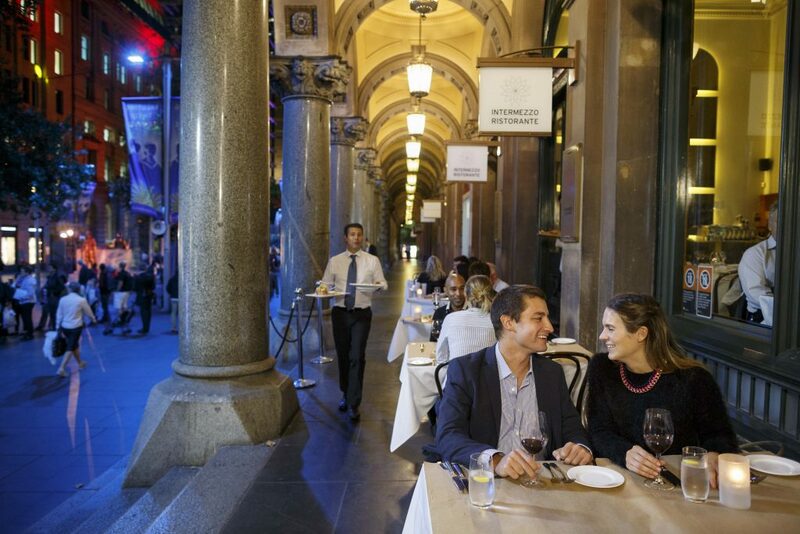 With a lovely selection of wines, nibbles, cheeses and a couple of mouth-watering desserts, make this a pre-dinner or late night stop, or even the site of a sneaky afternoon tipple (hey, you’re on holidays after all!). 1 Tank Stream Way, Sydney. Monday – Thursday, 4pm – late; Friday 12pm – late; Saturday 6pm – late. If the gourmet pub grub, beaut wines, cocktails and icy cold beers haven’t already got you in the doors, then the stunning architecture of this North Sydney landmark surely will. Built in 1878 as a church, the site was later a school. Rumour has it that the now hotel’s men’s toilets is the site of the former school principal’s office! The school boasts a proud alumni and The Greenwood Hotel a regular crowd of pubgoers, be it for a big night out or a quiet ale. 36 Blue Street, North Sydney. Monday – Friday, 11am – late; Saturday 5pm – late; Sunday 1pm – late. Finger Wharf, Woolloomooloo. Image: Destination NSW. Once the waterfront “office” of working class Sydneysiders, Woolloomooloo’s Finger Wharf is now home to a buzzing Sydney social scene. Built between 1910 and 1916 as a wharf and passenger terminal, it was used for everything from the export of wool to troop deployment to the world wars and a disembarking point for new migrants arriving in Australia. These days the harbour-side location is a favourite among Sydney’s social elite and a magnet for foodies, with a bevy of restaurants offering cuisine ranging from Italian and Indian to Australian and Asian. 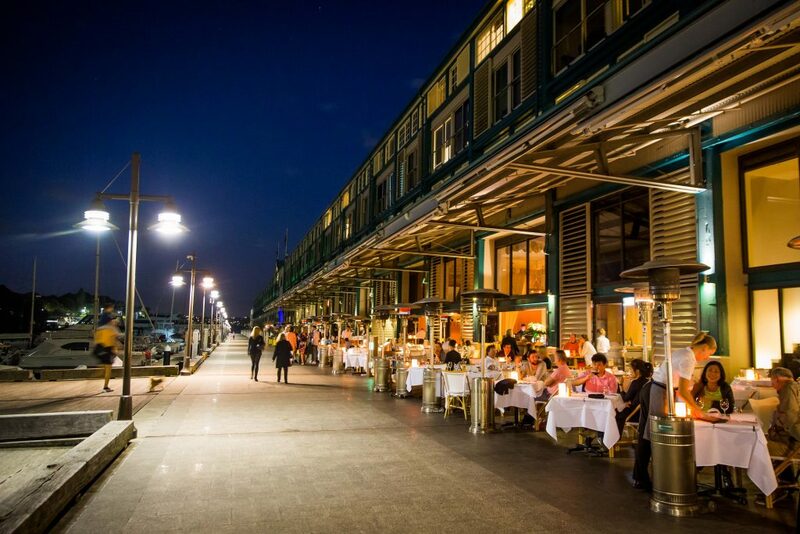 Apart from the fine food and stellar location, Woolloomooloo’s Finger Wharf is also famed for being one of the longest timber wharves in the world. 6 Cowper Wharf Roadway, Woolloomooloo. 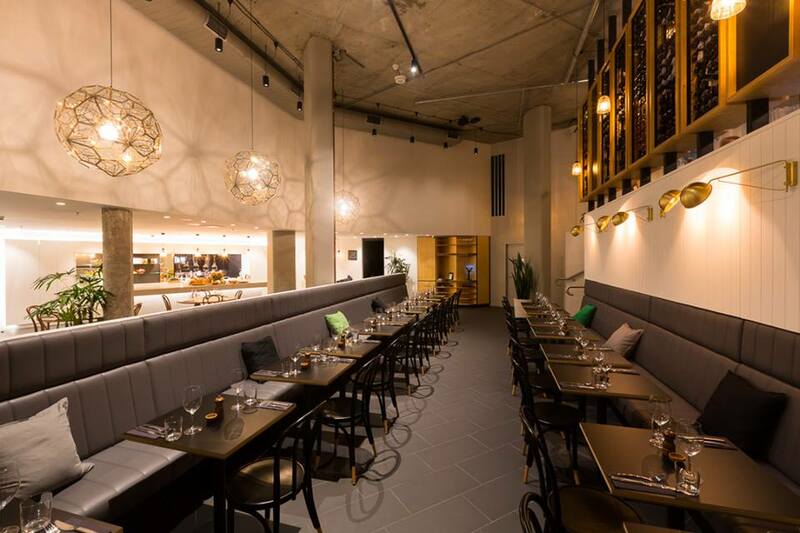 This is one of our fave places for an after-work drink or late-night boogie, and no matter how many drinks we’ve had, we can always appreciate the beautiful architectural interiors of the ArtHouse Hotel. Designed in 1830, the heritage-listed property formerly housed a school of arts. These days it’s home to four bars and a restaurant. In keeping with the arts tradition, the venue hosts creative events including life drawing, art exhibitions, burlesque and cabaret variety nights, photography workshops, and DJ and club nights. Monday – Wednesday, 10am – midnight; Thursday 10am – 1:30am; Friday 10am – 3am; Saturday 12pm – 1:30am. Located at the water’s edge of the world-famous beach, The Pantry Manly has total rights to boast one of the best views in the suburb! 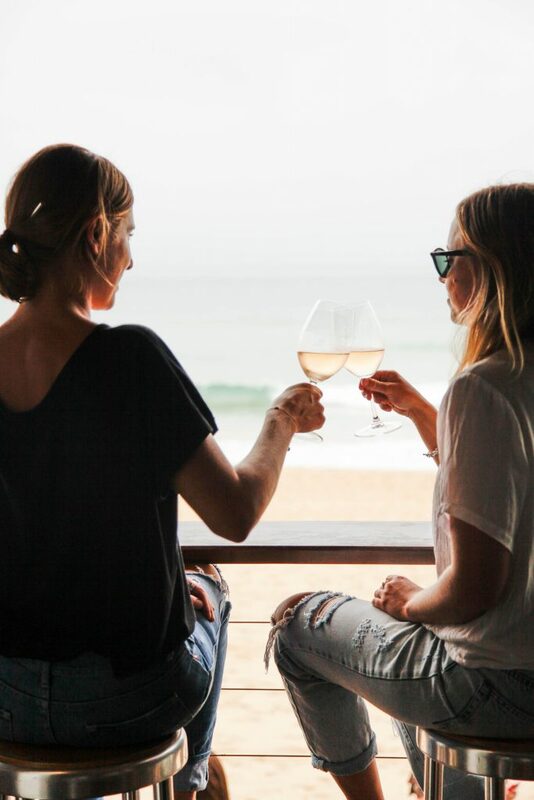 So close to the water’s edge is this popular northern beaches day-to-night dining destination, it served from 1919 as the beach’s tea house and change rooms, then in the 1980s as an information kiosk and the 1990s a restaurant. Since 2010 it’s been known as The Pantry Manly. As well as being a place to sit back, relax and take in the famous Manly vibe, this place offers a mouth-watering selection of fresh, local and seasonal produce for a lazy breakfast, long lunch or moonlit dinner. The menu features a choice of succulent meat dishes, freshly caught seafood and sharing plates complemented by an extensive wine, craft beer and cocktail list. Ocean Promenade, North Steyne, Manly. Breakfast 7:30am – 11:30am; lunch and dinner 12pm – late. GPO Grand. Image: Destination NSW. As the name suggests this magnificent late-19th century sandstone building and clock tower, perched on the edge of Martin Place (stretching some 114 metres, making it one of the largest sandstone buildings in Sydney), was once Sydney’s General Post Office, the headquarters for Australia Post until the late 1990s when the building was privatised and refurbished. There’s still an Australia Post shop located here, while the rest of the building is devoted to shops, cafes, restaurants and bars – known collectively as GPO Grand. Drink, dine and be entertained!